48 • FOODSERVICE EQUIPMENT & SUPPLIES • SEPTEMBER 2018 and connect with anyone at whatever stage of the business they are in." Harrison has even been known to order rugby uniforms for clients. "I work with many overseas customers, mostly oil refineries and camps for fracking, and we also supply boats and cargo ships going across the Atlantic," he says. "Once, an oil refinery customer wanted a bunch of rugby uniforms, a treadmill, and 40 George Foreman grills so they could feel more at home. My supervisor asked me why all of this stuff was on the order, and I said, 'They wanted to have a barbecue and work out!' We supply anything and everything our customers need, not just equipment for the kitchen." Harrison's longtime customer Cohen, owner of Twisted Kitchen, a build- your-own pasta fast-casual concept with two locations in Georgia, knows this firsthand. "We became friends before we became business associates," he recalls. The duo first met around 2012, when the original location opened. "He would often come to the restaurant to eat and we got to talking, and I found out what he did," Cohen says. "Obviously, as a friend I'm going to give him a shot to do my next res- taurant, and that's what I did in 2016. Opening a restaurant, especially one in a big city, is amazingly stressful, but Eric would always have such a relaxed attitude and demeanor and he would look at me and say, 'Don't stress this, I got it. Even if he knew he didn't got [sic] it you knew he was going to get it.' " And there were definitely issues with that second location opening. Number one, the architect missed a gap in the floorplan so Harrison had to work with Cohen to redesign and rearrange the storage, prep and dish area. Then, the landlord changed the way they could vent the hood system, causing Harrison to scramble to figure out a way to vent the kitchen. "I would never have been able to handle that on my own at the time," Cohen admits. When asked how he figured out what to do, Cohen pointed at Harrison and replied, "My hood guy and I worked with the landlord to figure out what would be the easiest and most cost- effective way at that point to vent the kitchen to everyone's liking." Timeliness is crucial too, for Cohen and many other clients. After all, the company is called Supplies on the Fly for a reason. "Chains, and any operator, really, can't wait a week for something," Harrison says. "Sometimes they can't wait a day or even hours." Outside of his core client base, Harrison spends a lot of time getting to know as many manufacturers' reps as possible. "Now that everyone can sell past their state lines, everything is blur- ring right now," he says. "I have worked hard to get to know the reps outside of my region so that they can help me sell more equipment, but I also help them out and make sure they're getting those credits for the sale." Harrison also remains active in the company's buying group, Supply and Equipment Foodservice Alliance (SEFA). "SEFA really stuck their necks out for us and were the ones to put us on the map as a dealer," says Harrison, who attends many SEFA training ses- sions and brings reps into his office to train salespeople. 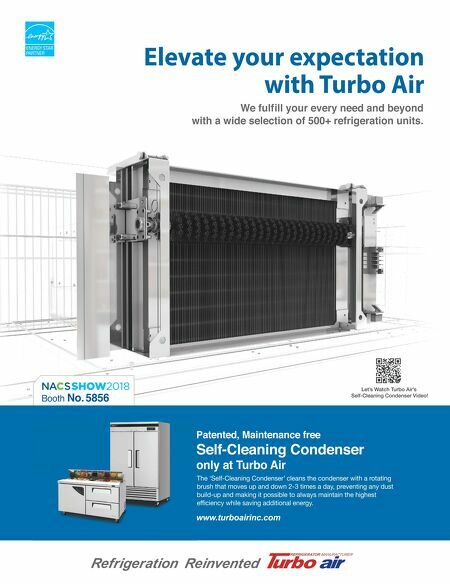 He also leverages the buying group and his contacts through it to learn more about new equipment and technologies, in addition to walk- ing the floors of shows put on by the National Restaurant Association and the North American Association of Food Equipment Manufacturers. Indeed, the people, including his cli- ents, colleagues and industry partners like manufacturers' reps and others, are truly what keep him going day after day. 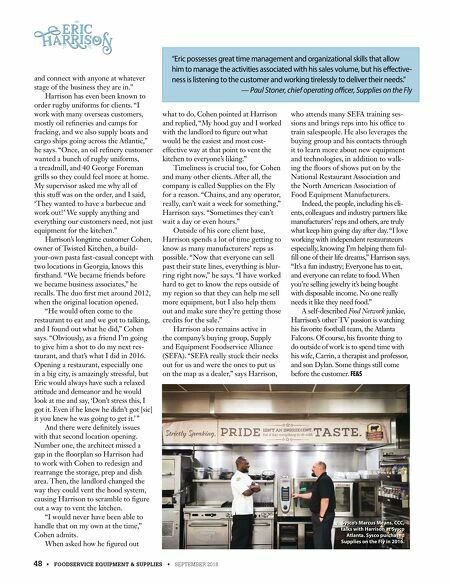 "I love working with independent restaurateurs especially, knowing I'm helping them ful- fill one of their life dreams," Harrison says. "It's a fun industry; Everyone has to eat, and everyone can relate to food. When you're selling jewelry it's being bought with disposable income. No one really needs it like they need food." A self-described Food Network junkie, Harrison's other TV passion is watching his favorite football team, the Atlanta Falcons. Of course, his favorite thing to do outside of work is to spend time with his wife, Carrin, a therapist and professor, and son Dylan. Some things still come before the customer. FE&S "Eric possesses great time management and organizational skills that allow him to manage the activities associated with his sales volume, but his effective- ness is listening to the customer and working tirelessly to deliver their needs." — Paul Stoner, chief operating officer, Supplies on the Fly ERIC ERIC 7 Sysco's Marcus Means, CCC, talks with Harrison at Sysco Atlanta. Sysco purchased Supplies on the Fly in 2016.